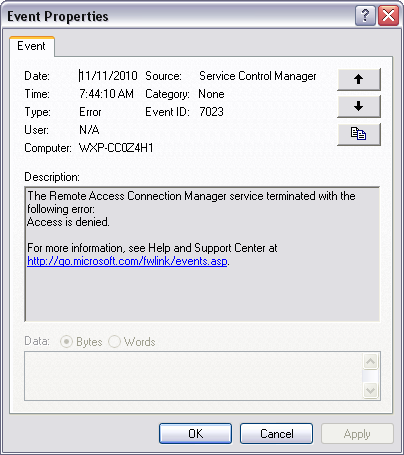 Huge issue with Windows XP3 and RRAS – RESOLVED! Some of you know I work for Dell in the Global Professional Services division. Because I work for a large entity, I get a laptop with a corporate image. This image has all the apps I need to access internal Dell stuff. Lately, I’ve been putting off a corporate mandated Service Pack 3 upgrade. Why? Because the upgrade completely hoses my RRAS stack. Because of this, I can no longer VPN into the network (or VPN into my home network for that matter). I also cannot use my broadband card built in. 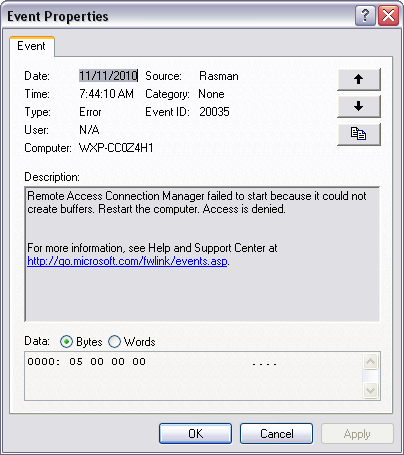 Those errors will bring up articles with all sorts of various solutions including but not limited to Deleting some of the numbered keys under EAP [HKEY_LOCAL_MACHINE\SYSTEM\CurrentControlSet\Services\RasMan\PPP\EAP]; repermissioning Anonymous Login, etc. None of those suggestions worked. The RRAS stack was hosed and corrputed thanks to the SP3 update. Now to be clear the initial “hosing” was done through an SMS package pushed by the corporate image team. I thought there *might* be some tweaks they did to the package and decided to download the clean SP3 installer from Microsoft. However, after installation and reboot, that didn’t fix anything either. So my tech support internal to Dell had decided it wasn’t worth fixing and told me to upgrade to the Windows 7 corporate image….which BLOWS AWAY everything on my laptop and I would need to install literally hundreds of programs again….BLAH! I hope this helps anyone else out with the same problem. There is no need to reinstall XP. Just purchase this tool, uninstall RRAS, reboot, reinstall RRAS, reboot, and you’re back in business.